Jedox corporate performance management software streamlines budgeting, forecasting, and planning across finance, sales, human resources, procurement, and other departments. Integrate financial planning and analysis with operational plans and reporting to optimize processes, boost data quality, and slash planning cycles throughout the organization. Unite all Planning Users and Data on one Platform. Attention Excel stars and skeptics! 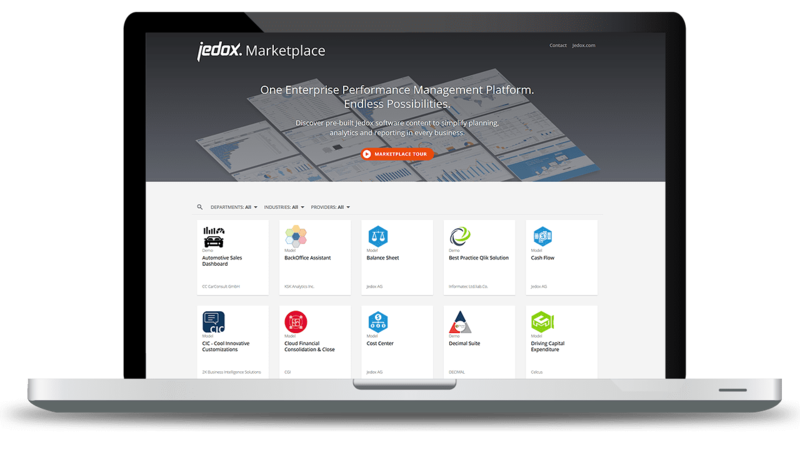 Jedox Models in the Jedox Marketplace help kick-start your planning solution with pre-built templates for P&L, Cost Center, Sales Planning, HR Planning, Balance Sheet, and more. Each model contains out-of-the-box reports, databases, business logic and rules, workflow, and integration jobs which you can flexibly configure and customize to your needs. A rapid time to value is guaranteed. Respond to the changing complexity in your organization or process with one of the most flexible platforms in the industry. Connect seamlessly to any data source in the cloud or on-premises using the powerful integration tool from Jedox. Choose your preferred user experience: a familiar Excel environment or intuitive web and mobile applications. Benefit from the Jedox multidimensional database that leverages latest in-memory computing technology and GPU power for real-time analytics and low latency. Deploy your application in record speed thanks to rapid prototyping, agile implementation, and application development without coding. Empower employees on the go through mobile and social technology. Enables agile corporate performance management anywhere, anytime and on any device. Safeguard your data through granular user roles and permissions – even down to a single cell level. Discover why customers continuously give Jedox excellent ratings for “price to value” and make their enterprise standard for driving business performance. We’d love to share latest on product releases, updates, events, and best practice insights. Jedox got honored for its outperforming business success and growth by Deloitte’s “Technology Fast 50-award”. Jedox is officially confirmed to be one of the fastest-growing tech companies, located in Germany and spanning a worldwide business. “Florian Winterstein is an expert in fast-growing and international SaaS companies. We are proud to have him on board to lead Jedox’s global acceleration,” comments Curt Gunsenheimer, member of the supervisory board and Senior Partner at Iris Capital. Jedox receives 22 top ranks in important KPIs such as Business Value, Business Benefits, Project Length and Self-service in world’s largest survey of planning users. Stay up to date with the latest from Jedox. Subscribe today.